#1. There were no pilot holes drilled. THe screws sere simply run into the studs. So I could have gone to Home Depot, bought a new cabinet that would actually match these old ones, yes they still make, and sell the same lousy cabinets. But in true Dave's Workshop fashion, I just HAD to fix what I had.... Even if it included having to buy a new tool which, you know breaks my heart... Or not. Part 1, Design finalized, and shopping for the supplies. Part 2. Parts cut, and making space to work. What a mess! Part 3, Sanding and Painting. Part 4, assembly and loading it up! And the completed rack ready to slide into place! 2 @ Intel dual port gigabit PCIe ethernet adapters. MSI Radeon 6450 2GB graphics cards. All 4 of these measure up to be just at 4u high when flipped sideways and put on the rack rails. Then there are the 2 TrendNet TEG-S16DG 16 port 1u gigabit switches. That brings me to 18u. I will need 1u of space to apss cables from the front of the switch to the back. That means the switches plus the pass through space gets me up to 19u. The rails being 20u, are 35" tall, the 1x4 lumber consumes 7" for the top and bottom spreaders, meaning that they use 42" vertical space. So the storage box can't go here. For now. I have the lumber cut, I have the hole locations for hte screws marked and ready to go. My long term plan for this rack, is to lay my hands on 4 2u ATX cases that are compatible with a standard ATX 12v / PS2 style power supply. I have high end power supplies that I am not going to get into here, that I do not want to retire. Recall this is an office yes, but it is also a music room / studio. So even though it is going into the closet next to the room, I want to insure sinlence is the sound of the day! 20u DIY server rack. Final plan in place. So I have been tasked with a project. What was going to be a dedicated home office / study space for me, is now going to be a shared space home office, / guest bedroom. Meaning the big 48” wire bakers rack LAN rack has got to go! And the structured wiring rack on the wall? Nope. It needs to get hidden. I have been directed to move all the network gear, AND my virtualization cluster gear, into the closet. But just how am I going to do that? Simple. Improvise a server rack, and rack mount my mid tower servers. Measurements are good, so I know this is doable. There are 3 critical dimensions. The mounting space side to side of the rack rails, the height top to bottom for the rack rails, and the distance front to back for the rack rails. To reduce the overall weight, and space down of the rack build, keeping the costs down, as well as simplifying the build by reducing the number of steps needed to prep the lumber, I am opting for 1x4 lumber instead of my initial plan of using 2x4 and planing it down the thickness. Side to side 19-⅝” to keep the centers of the bolt holes at 19” spacing. Rail opening 35.25” (20u, 1u = 1.75”). Add ¼” to this height for wiggle room. Front to back. There are 3 standard depths, 19”, 23” and 30”. We are going to opt for the 30” depth to insure we aren’t too cramped for cables, or airflow behind the rack. Once built, the rack will be populated, from bottom to top as follows. 1-4, 4U desktop converted to rack server. 5-8 4U desktop converted to rack server. 13-14 2U desktop converted to rack server. 15-17 4U desktop RAID shelf converted to rack RAID shelf. 18 & 20 2 @ TrendNet TEG-S16DG 16 port gigabit ethernet switches rack mounted. Cables to pass through to back of rack between switches. Due to mounting considerations, I do NOT want these switches rear facing as I want to be able to see the link / activity lights when in use. There is a 7u 10” deep wall mount rack that will be mounted to a mount board immediately above the server rack. That will house from the bottom up. 1 1U rack shelf, housing 2 @ Obi100 VoIP adapters, and resting pigtails from above device. 2 1U rack mounted PDU, front switch, rear ports. Pigtails to allow for wall wart transformers, these will rest on the shelf below. 3 1U TrendNet TK-803R PS2/USB KVM 8 port. This will require a pass through setup from one side of the wall to the other to allow for the connection to the video, keyboard, and mouse. 4 1U TrendNet TEG-S24G 24 port gigabit ethernet switch. 5 1U open space to pass cables behind, and either down to rack, or up to ceiling penetration to pass through the rest of the house. 6 1U TrendNet 16 port gigabit patch panel. 7 1U 10” deep cantilever shelf housing cable modem, WiFi router, and Antenna rotator control box. On mount board above will be housed. 48 1.25” wood / deck screws. 28 #8 .5” round head wood screws. 2 @ Reliable Hardware Company RH-20-SRR-A 20U Full Hole 20 Space Rack Rail Pair. Rack conversion rail / partial shelves. NavePoint Adjustable Rack Mount Server Shelf Rails 1U Full Depth 4-pack (These should come with the rack screws). Rust-Oleum painter's touch gloss black spray paint & primer in one. Measuring tape and marking pencil (Fine lead please!). Saw that can cross cut in a straight line. Either a miter box and saw, electric miter saw, radial arm saw, circular saw with rafter square and clamp, or table saw and miter fence. Drill bit set to drill pilot holes. Counter sinks to relieve for the screw heads and reduce chances of split out. Phillips screw driver bit for drill. Cut list for 1x4 final dimension lumber. 4 @ 19-⅝” for spreaders. 4 @ 29” front / rear runners top and bottom. Measure, mark and make cuts for each component. Lay out and mark upper and lower box joints. Pre drill pilot holes for upper and lower box joints. Relieve screw holes with counter sink. Assemble upper and lower box joints making sure the boxes are square. Set up boxes to uprights on one side, insure everything is square, mark, and pre drill pilot holes, and countersinks. Assemble uprights onto boxes on first side, flip over repeat process. Measure, and assemble rack rails onto rack body. DIY 20u server rack. Prepping and planning. As life progresses my requirements for the home office are changing fairly quickly. What was once going to be a shared office space, IT training lab, and music studio is being forced into being converted into a guest room and home office. This means the large 4 foot LAN rack and the wall mounted switch rack just aren't workable anymore. What I'm going to have to do is move the computer armoire from the bedroom into here this will has the monitor keyboard mouse and printer as well as a docking station for the laptops. The real meat of the matter and where massive things are changing is the entire structured wiring is going to stay on the mount board but the mount board switch rack and all are being mounted in the closet and the desktop computers are going to be converted to rack mount as is the RAID cabinet. This is a fairly massive change as I have already started pulling the ethernet telephone and coaxial cabling as you would already know if you watch my videos. Now I can fairly easily go out and buy a prefabricated 20u four post server rack for about $175 but that just wouldn't be Dave's Workshop. No I'm going to have to make one. Now I'm not much for metal work it's just not my thing so what I did was I went out to Amazon and sourced up two pairs of 20u rack rails. They were less than $30 a pair after taxes. I have way more than enough screws for this job but I still need to go to Home Depot for some supplies. It's hard to believe but I am down to only one 2 by 4 in my inventory so I need to buy three more that's straight and dry as possible. I will also need a can of brush-on gloss black acrylic enamel. Yes I could do this with spray paint but I don't really want to. The dimensions that the frame has to enclose is 19 and 5/8 wide by 35 and 1/4 High by 30 in deep. The height is 1/4 inch over the standard however I am wanting a little bit of Slack to allow 4 Non standard size components. My idea is to get some adjustable depth rails that will act as shelves for the desktop Pcs, and stack them up along the rack. The cheap cases I got actually come right in at 4u high, I have a small mini ATX based system that is being used as the storage controller and cluster front end and of course the RAID cabinet itself which will be placed on a deep 19 in rack Shelf. The cluster switches will be moved into this rack so that all of the components for cluster are in this rack. That leaves the TV coax distribution the 24-port ethernet switch and its associated cables the telephone distribution the cable modem the Wi-Fi router and the VoIP adapters to go into the switch rack which will be mounted immediately over the server rack. the server rack build will be the subject of a video on my channel and will be linked here. The process should be fairly simple however I want to show it being done with as minimal of tools as possible so my plan can be followed by pretty much anybody. I will be using a circular saw a rafter Square a clamp a cheap cordless drill drill bits countersinks a driver bit and a sander. 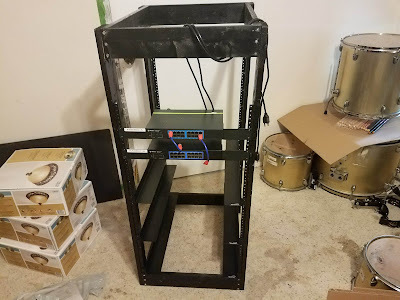 I will have to double back on this post to give credit for the inspiration rack build as this is not entirely my idea I mean yes I had the general idea in mind but I didn't really have the dimensions squared away right off the bat. There is a user that built one and use some Minwax dark stain of some kind is a finish for his I don't particularly want mine stained and unlike this other person I don't want mine on casters I want mine solidly on the floor. So I will be posting up again somewhat shortly with some progress once the rails arrived from Amazon and the other stuff comes home from Home Depot with me. And like always I will link the products I am using as much as possible if you would like to reproduce my project. Not all of the tools that I am using are on the market anymore such as my 1990's vintage skill saw has been replaced by a much newer model. And the Ryobi drill bit set that I have likewise has been replaced with a newer version I will however link that newer version. I am happy with the Ryobi bit set I should mention. Picking up with the bathroom remodel. Prepping the pine bead board wainscotting. The World Series is over, and after a half century old dry spell, the Houston Astros brought home a World Series to those of us in Metro Houston. So it's time to get back to work. I am pretty sure some of you read that and wondered if I have flipped my lid or not. I mean wainscotting? In 2017? Last time I had to deal with bead board, it was a thin gauge sheet plywood type product, but nowadays it comes in bundles of long sections, about oh what was it 5" wide or so maybe? So I had to set up a production stop, run through pre processing the stock, marking and ripping to width so that I can have my stock ready for installation. First of all, thank God that we didn't flood, however lots of our family and friends weren't quite so blessed. I am seeing things with this hurricane response that make me both sad for people, and angry at FEMA for their typical lackluster response to natural disasters. As you no doubt are aware, in late August, the Atlantic Hurricane season started beating on the United States with a vengance starting with Hurricane Harvey, which more or less parked itself over coastal texas, and dumped a years worth of rain in something like 4 days, over much of the Houston / Galveston metropolitan area. With the massive rainfall, the reservoirs just couldn't handle the water, and teh Army Corp of Engineers elected to release water from the dam, rather than to allow the dam to break, or simply overflow. This flooded homes, and neighborhoods outside of the published flood plains, meaning people with no flood insurance, because they believed what the government told them about the flood plains. And to make matters worse people that WERE insured for flood, are getting reimbursements that are pennies on the dollar for the value of their destroyed property, homes, and contents. These homes have been rendered unlivable, and yet, when insured homeowners try to claim temporaty housing benefits FEMA who manages the national flood insurance progaram, tells them they need to talk to FEMA, and of course the part of FEMA that doesn the emergency response says you need to talk to your insurance. Meanwhile people are stuck, in houses now growing toxic black mold top to bottom. We spent time over the weekend with folks in one of the neighborhoods that the Army Corps of Engineers water release flooded out, and, well you can certainly tell the Army was involved. The place looks like bombs went off in every single home. The debris field goes from house, across the street to the next house... The streets are white with the broken and now ground in remnants of what was at one time peoples walls. Home furnishings, and electronics were everywhere, and it didn't matter if it was all high end super expensive stuff, or cheap disposable particleboard garbage, it all was on the curb waiting for the hiant claw to come pick it up, and throw it all in a landfill. I know FEMA as well as pretty much every other government agency is stretched really thin at the levels that matter, the people that actually do the real work. And the folks in the field are doing the best they can, but let's look at some realities. #1. In 2005 when Hurricane Katrian hit New Orleans, FEMA trailer cities sprung up all over the gulf coast to house Katrina evacuees. Now in 2017, FEAM is saying no temporary housing trailers for people because the Katrina evacuees trashed the trailers they were provided. #2. The beaurocracy of dealing with FEMA is almost as bad as the storm itself. And folks need to know, if you don't have flood insurance, the ONLY help it seems like you are going to get, is an offer of a low interest loan, which most people can not afford. #3. We hear about all these hundreds of millions of dollars that have been donated for the relief effort, and hundreds of millions more that have been allocated to the City of Houston by the state for Harvey relief efforts, so where is that money going, and how is it being used to help people? Now I've got skils enough to hang sheet rock, cobble together cabinets, install insulation, replace sockets etc... But in working the volunteer efforts, to do the repairs and the builds, materials are in short supply or there is just no funding for what we need. While I have no way of knowing for sure, I feel confident in saying that the people of Florida are experiencing much the same pain as we here in Texas are. And I can not imagine what the citizens of Puerto Rico are going through. In so many ways, being one of the lucky ones that didn't get flooded, I can't explain to you the sort of, well like survivors guilt we have, and the frustration we are experiencing at trying to share our sweat and skills, and all of it seems to fall on deaf ears. We WILL get through this, and I am absolutely confident that the resources that need to go to the right places will eventually get there. It is just painful, and frustrating to watch my family, friends, neighbors, and fellow human beings have their lives put on such a painful hold while they try to pick up the pieces and put something back together. Remodeling project, DJ lighting for the music room, and out of the house use.... Things I am learning that aren't obvious. 8 @ @ 5 channel 86 LED DMX lights. Ebay seller Antiquechina.every bit as good as the ones from Amazon, for a lot less money. First things first. Addressing the lights, well that is confusing as all get out. The documentation that came with the lights, well, isn't super helpful, I had to dig, and research and go about getting this all figured out. What I learned makes sense if you understand how binary works. The dip switch addressing that is on the back of the lights, has 10 switches, 1 for DMX on / off, and 9 for addressing. Dip Switch #10 is the DMX on / off switch. So we have dip switches 1 through 9 that will have a value as shown below in Fig 1. Given that data, to set the 12 possible fixtures for the 16 channel Chauvet Obey 40, or cheap clones thereof, like the Lixada, you would set the dipswitches as follows in Fig 2.. Some items of note I found when setting this up. #1. on these lamps, channel 1 on each fixture on the controller in the main fade, but fade is the wrong word, the slider has to be ALL THE WAY on for the light to work, then you slide on / off / fade with slider / channel 2, 3, and 4. #2. The board is equipped with a "blackout" button, and it does exactly you you would think it does. I sort of missed that one on my first time out the door. #3. There is a small switch on the back of the unit that I have been told varies the polarity out of the DMX, If your lights don't come on, try the other position for this switch. So if you are setting one of these rigs up and trying to learn how to use it., Configure your lights as shown above, cable them in sequence. and make sure that channel 1 on each fixture / scan is all the way up. You might need to slide it down, then back up to get it to read properly. Per the manual for the Lixada, programming the device they recommend searching Youtube for Obey 40. So basically this thing is programmed the same way the Chauvet Obey 40. Again at a much lower price tag. How should I proceed with the air system? 2007-2014 David B. Hostetler. All rights reserved.. Picture Window theme. Theme images by andynwt. Powered by Blogger.